There is nothing more important than making sure your family is safe and comfortable in your own home. Of course you have the best doors, windows, locks and alarm systems in place just for this purpose. You also probably have a central heating and cooling system to keep the indoor climate consistent and comfortable year round. Bahr’s Propane & A/C Inc. is here to make sure the quality of the air in your Zephyrhills area home is maximized for your family’s health and quality of life. If you want to do something about your home’s indoor air quality, just give Bahr’s a call today. We offer an extensive variety of home air cleaners and air filters that can almost entirely eliminate these types of particles from your indoor environment. And if you’re not sure exactly what you’re looking for, our expert technicians will help you make an informed and productive decision based on your particular needs. Getting rid of allergens in your home is often a major concern. Whether they take the form of dust, pet dander or some other substance, allergens can, quite simply, make people with allergies miserable. Installing an indoor air cleaning system can help to end that suffering by eliminating up to 99.97% of particles measuring 0.3 microns or more in size. Germs are another major issue when you’re trying to make the air in your house safe for everyone to breathe. They can lurk in the ventilation system of your house and easily spread all over from there. However, by using UV Germicidal Lights, many indoor air cleaners are able to kill these dangerous microbes before they have a chance to make your family sick. 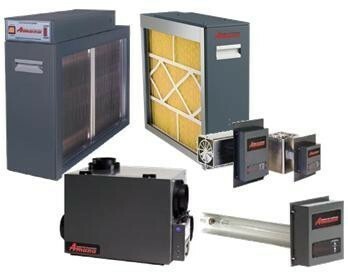 These too can be eliminated with the installation of one of our top of the line air cleaning systems. No matter what particular contaminant you’re concerned about, you can rest assured that the system we install will remove it quickly and easily, improving your indoor air quality. When you choose Bahr’s to help you improve your indoor air quality, you’re getting more than just a high quality system. You’re also getting the commitment to customer service and attention to detail that have been the hallmarks of our company since we first opened our doors more than 20 years ago. At Bahr’s, we know our continued success is due to satisfied customers like you and we don’t want to do anything to jeopardize that relationship. We strive to give you only the best in terms of parts, systems and services from day one, and we’ll be happy to answer any questions you may have along the way. You’ll also benefit from our extensive experience with this type of equipment and installation. All of our technicians are up to date on the latest developments in the field and they have access to all of the necessary tools and equipment to carry out this type of installation. And our commitment to you doesn’t stop once we’ve completed the installation of your indoor air cleaning system. We’ll be happy to come back for annual maintenance visits, as well as to troubleshoot any problems you’re having and carry out emergency repairs. When you’re doing business with Bahr’s, help is only a phone call away. “Just a word of thanks for the great service your company provides. You can be proud of your employees; they represent your company well. I’ll recommend your company to anyone who needs A/C work done.” Ed T.